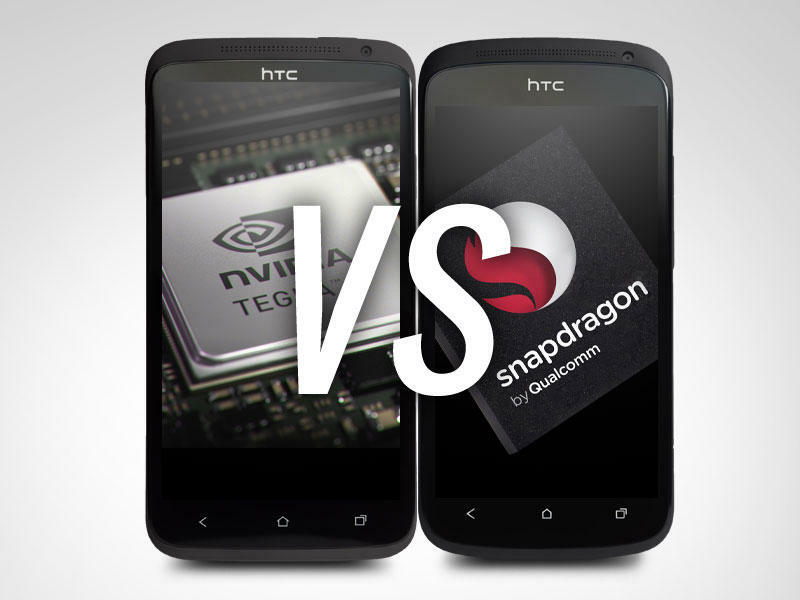 We’ve been dying to get our hands on both the HTC One X and the HTC One S for one particular reason: The two phones finally give us an opportunity in which we can — as closely as possible – compare the performance of the NVIDIA Tegra 3 chip and the Snapdragon S4 (hands-on video here). The One X employs the quad-core Tegra 3 processor while the One S runs on Qualcomm’s MSM8260A Snapdragon S4 Krait CPU with Adreno 225 graphics and, since the pair’s hardware is similar and the software is nearly identical, we can test the two processors fairly evenly. That said, the One X has a much higher resolution screen (720p HD versus qHD on the One S), so things are skewed towards the One S’s S4 from the get-go. Judging GPU performance has a lot to do with how quickly the pixels are refreshed, and fewer pixels makes it easier on the processor. The One X, for example, has 77% more pixels to render than the One S, which puts its GPU at a disadvantage. Before we get started, let’s compare the processors. The NVIDIA Tegra 3 processor offers four cores and a fifth “battery saver” companion core that can be used for side tasks that do not require quad-core power. NVIDIA explained that the four ARM Cortex A9 cores in Tegra 3 are also capable of scaling down their clock speed automatically in order to meet the demands of applications. If, for example, you’re playing a resource-intensive game, Tegra 3 will power all four cores to 1.5GHz and give you all you need. But if you’re just browsing the web, the cores may scale down to 750MHz each for more efficient battery life. Why? Qualcomm’s S4 processor, on the other hand, is powered by two more powerful Cortex A15-class “Krait” cores. Those cores, much like NVIDIA’s, are capable of scaling the processor clock speed up or down to meet the needs of the applications that take advantage of them. Qualcomm calls this tech “power smart.” The Krait processor is more energy efficient in general than the A9, which means it should offer more power without consuming as much energy. Texas Instruments has already published a video that shows two ARM Cortex A15 chips killing four Cortex A9 chips in a benchmark test, but we don’t know is if the devices were otherwise identical, or how they actually performed in real life. We’ll go through a series of benchmarks so you can see the numbers for yourselves, but then we’ll also walk you through real-world tests of the One X and One S. Overall, we’re expecting the phones to perform similarly to one another — although NVIDIA’s Tegra 3 is expected to blow the S4 away in gaming tests, mainly because NVIDIA has developed games to specifically take advantage of their quad-core CPU. In any case, let’s dive in first with that video from TI. First, a brief explanation of what each of these benchmarks does. AnTuTu v2.7.3 is capable of testing the performance of multiple cores. We chose this test because it allows us to see how two cores compete against four cores. In addition, it shows how 2D/3D and I/O capabilities of each processor perform. However, the 2D/3D tests are resolution dependent so the Snapdragon S4 has an upper hand because it has fewer pixels to render on the One S’s display. SmartBench 2012 starts by calculating pi and then running a series of graphics-based tests, string tests and 3D renders. It’s a standard test that’s frequently used to benchmark phones. AndeEMark is especially important because it was built by the Embedded Microprocessor Benchmark Consortium. AMD, Intel, NVIDIA, Qualcomm and many others are part of the consortium, so this is a test that’s been standardized and approved by a group of chipmakers and industry insiders. AndeEMark is capable of testing multicore and multithreading capabilities of a given processor and can also test the Java efficiency of the CPU. Winner: Tegra 3. Higher scores are better in the chart above and we can see that NVIDIA’s Tegra 3 was the clear winner in AndeMark Native, SmartBench 2012 and AnTuTu v2.7.3. It posted higher scores for every test, although the benchmarks for SmartBench 2012 were relatively close. Winner: Tegra 3. In this test, Tegra 3 came on top. It’s visible here that the Snapdragon S4 Krait processors were showing their ability to compete nearly head-to-head with four Cortex A9 processors. Quadrant is a popular test that’s used all over various Android forums to compare devices. It’s an accurate test for performing multi-threaded CPU tests, but it doesn’t accurately portray 2D or 3D graphics performances because there isn’t an option to change the screen resolution. Winner: Snapdragon S4, but if anything is clear here both processors absolutely slaughtered the dual-core chips in the Galaxy Tab and Galaxy Nexus. In this test the Tegra 3 was rendering 3D graphics for a much higher resolution display than what the S4 had to power. 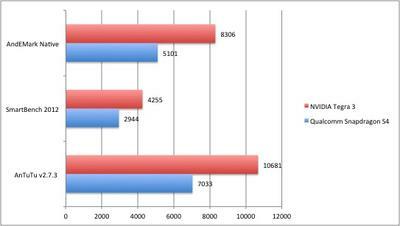 You’ll see here that the S4 generally outperformed Tegra 3 but that its CPU results fell behind T3′s. The S4 won Quadrant’s Memory, 2D and I/O tests but it lagged in the 3D tests, even though the One S has a lower resolution display. 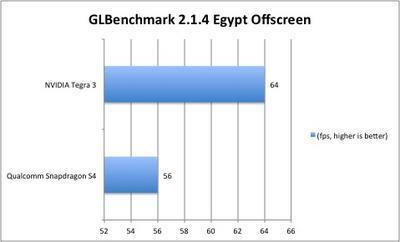 GLBenchmark 2.1.4 is an excellent comparison test because it provides an “Egypt” benchmark that tests Open GL ES 2.0 performance, which most new games take advantage of. It also supports “offscreen mode” for rendering to a specific, display-independent resolution. This allows us to test the S4 versus the Tegra 3 without taking the physical screen resolutions of the HTC One S and the HTC One X into consideration. Winner: Tegra 3. Tegra 3 won simply because it was able to display a greater number of frames per second (higher scores are better). However, the S4’s 56 frames per second is still an incredibly respectful score. It would be pretty much impossible to distinguish a game playing at 64 frames per second versus one playing at 56 frames per second. 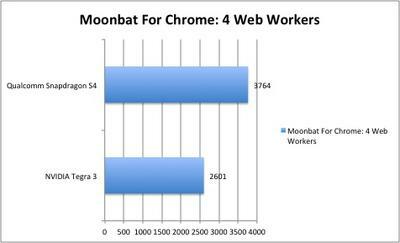 Moonbat allows users to test the multithreaded CPU performance inside of the Chrome web browser using a series of Java-based tests. In this case, the lower score is better because it means the benchmark finished faster. Winner: Snapdragon S4. I set the “Webworkers” figure to four for Tegra 3, so that all four cores were running, and set the same figure to two for the S4 to activate both of its cores. 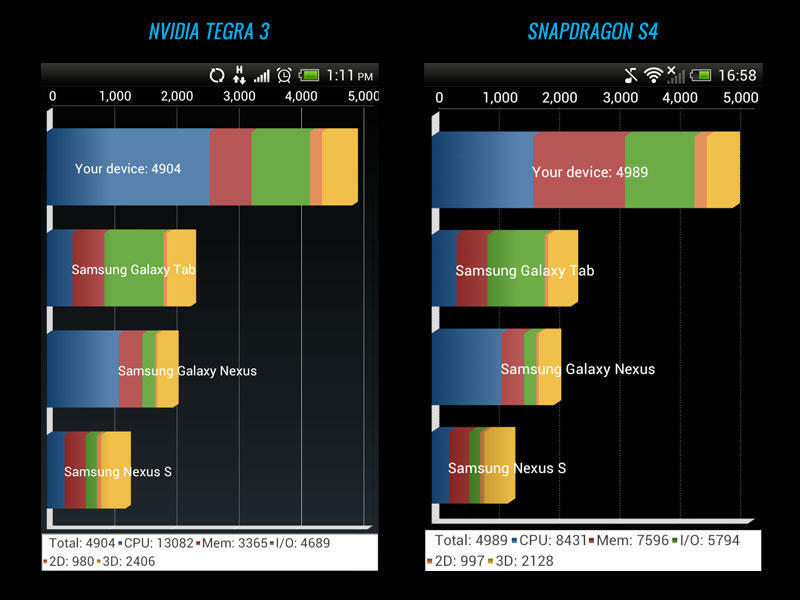 The Snapdragon S4 won, completing the tests roughly 33% faster than Tegra 3. UPDATE: We’ve added a second chart and in this case set both processors to run four threads in Moonbat (representing four tabs in Chrome, for example). That means that Tegra 3 will offload one thread to each core while the S4 chip will run two threads on each of its cores. Tegra 3 wins in this test because it’s able to better execute the task across more cores. However, the S4 only has two cores and so we originally ran the first test to reflect that. 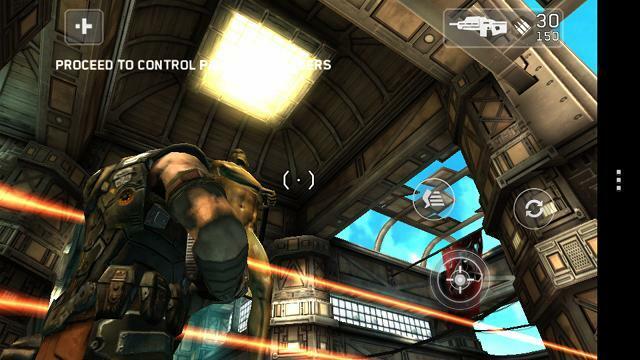 NVIDIA has created a tweaked version of Shadowgun for Tegra 3 devices. There’s more detail in the 3D world, which means the game looks better overall. That’s one upside to owning a Tegra 3 device: the company works with developers to create Tegra-specific versions of games (sold through the Tegra Zone application) with much more detail, including water effects, smoke, fire and physics. There’s more glowing effects around lights, for example, and the armor is noticeably much more elaborate on Tegra 3 than on Snapdragon S4. 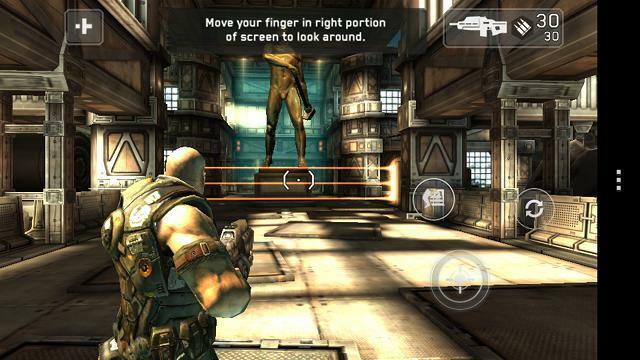 There are quite a few Tegra-optimized games out now and many more are expected to launch later this year. It’s not fair to compare the S4 against the Tegra 3 in a game that was specifically designed for the Tegra 3. 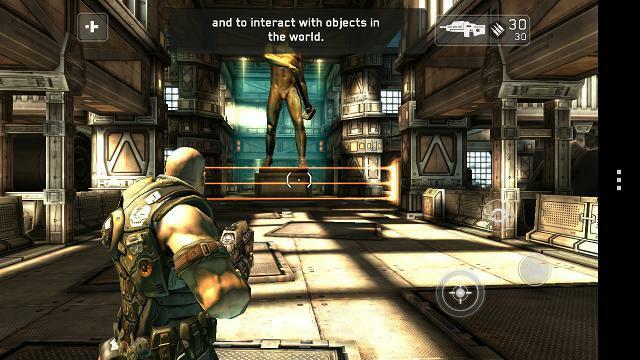 So in this test, I simply compared the real-world gaming experience of Shadowgun on both the HTC One S and the One X to see if there were any noticeable differences. Overall the game acted and looked nearly the same on both phones, although the graphics were admittedly a bit more crisp on the One X simply because it has a higher resolution display. What does this tell us? That the S4 can hold its own to the One X when it comes to games that are designed to run across multiple processors. As you’ll note in the screenshots below, there are relatively few differences between the two games. Tegra 3 offers four processing cores (plus a fifth battery saver core), which allows applications to unload onto a larger number of processors. That means you’re splitting the power across four cores instead of just two, which theoretically will help save battery life. 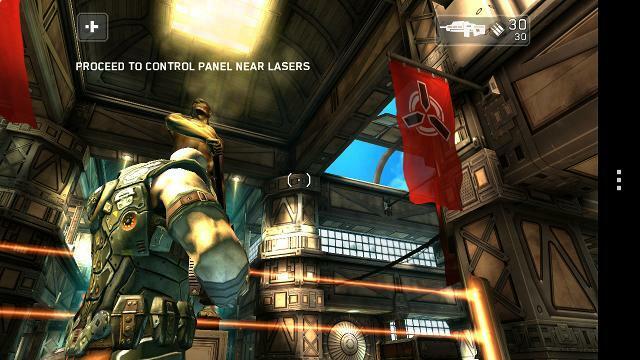 NVIDIA is working closely with developers to create special Tegra Zone games. That means you not only have access to the original games in the Google Play store but also the enhanced versions from NVIDIA. Incredible multitasking performance in real world tests. Support for real-time physics and dynamic lighting in games. NVIDIA has not yet announced partnerships with U.S. carriers to offer 4G LTE devices with Tegra 3 in the U.S., but that is likely to change down the road. That means Qualcomm, with its Snapdragon S4 processor, has the upper hand when it comes to providing 4G LTE chips. Qualcomm is the largest supplier of 4G LTE radios in the U.S. To its credit, NVIDIA already has solutions for 4G LTE support in Japan and the company has partnerships to provide 4G LTE solutions elsewhere, too. Currently only available in the One X, LG’s upcoming Optimus 4X HD and the ASUS Transformer Prime tablet. Tianyu, ZTE and Fujitsu have also announced Tegra 3 powered devices although we don’t suspect we’ll see them in the United States. Excellent gaming performance in real-world tests, plus the ability to play hit games such as Order & Chaos from Gameloft. Qualcomm adds support for 4G LTE networks, which means we’ll see these devices in the United States before Tegra 3 smartphones. The HTC One X on AT&T and the EVO 4G LTE on Sprint are just two examples, although we’ll surely see more. Utilizes Cortex A15-class Krait processors instead of last-gen A9 chips. 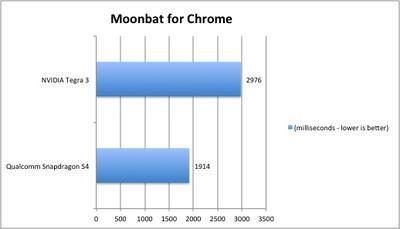 Better browser performance score in Moonbat. No access to Tegra Zone games. 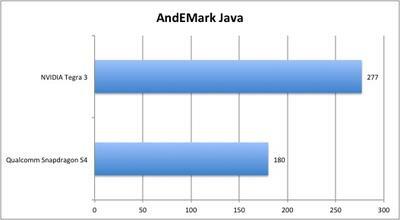 Fell behind in 3D benchmark tests as well as in AnTuTu v2.7.3, SmartBench 2012 and AndEMark Native/Java. NVIDIA’s Tegra 3 processor wins this comparison because it not only performed better in a larger number of tests, but also because the company has a developer community creating excellent games that are specifically designed for its devices. No other chipmaker is doing this right now. While Tegra 3 employs older ARM Cortex A9 processors, it does so in a power efficient way. Our only reservation is that, while it supports 4G LTE networks right now, there haven’t been any announcements as to when it will launch on a U.S. carrier with that support. That’s a huge, huge drawback but we should see progress later this year. For everyday smartphone owners, Snapdragon S4 comes out on top, however. Why? It’s faster when it comes to Web performance, which is huge in day-to-day use. Also, it’s going to be available on more devices in the United States sooner, and choice is a good thing. But if you’ve been following NVIDIA since the early days when the company was building PC GPUs, you know it’s a company focused on delivering the most power to gamers while providing an experience that’s future proofed against heavier applications down the road. NVIDIA’s Tegra 3 is the chip for mobile gamers, mobile enthusiasts and anyone who wants to milk every last drop of power out of their smartphone or tablet.